Do you remember Abigail Berne girls? Gabriel Berne was crossing that black hopeless desert she herself had once crossed. He looked at her in the greatest astonishment. "Yes Abigail, your friend from La Rochelle, the woman who has always been a friend to you. She has loved you in secret for a very long time now. She might even have been in love with you at the time you got married. For years now she has lived in your shadow, and her love is making her suffer too." 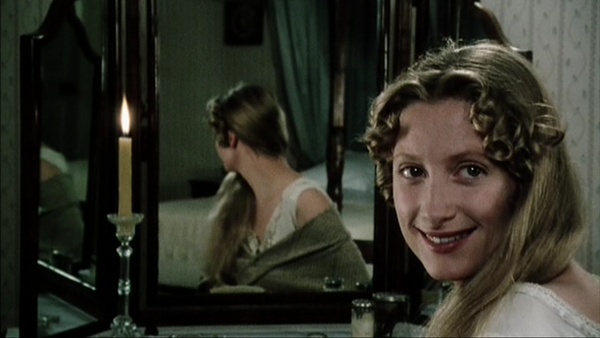 We think Susannah Harker as Jane Bennet in Pride and Prejudice (1995) is the perfect Abigail for our dream Angelique movie casting. Anne Golon is describing Abigail Berne with the face like Flemish Madonna, very long hair and soft and gentle character. Here's the perfect Abigail for me. One picture with lovely long hair and another with a bonnet. Angelique knew that this conversation with him would make her feel that she had lived for a brief moment in a totally different world from that of her companions. This was how the seducer found the infallible way to reach women`s hearts.